UPR's T-7075 Billet Extreme Shifter Handle Kit is fully adjustable in height and angle to make it the best handle on the market. 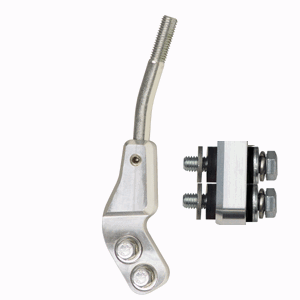 The UPR Extreme shifter handle kit combines the quick shifts of a short shifter handle with an easy to reach design. UPR's three axis bend positions your hand exactly right, for the shortest, most precise and clean shifts. No more reaching for 3rd or 5th gear. When changing out the shift handle it's also a great time to upgrade to one of our Billet Shift Knobs. Shifter Handle Base is crafted from 7075 Billet Aluminum and allows 360 degree rotating of the shifter handle as well as 2" of height adjustment from the lowest setting, which means infinite adjustability with our shift handle. The side mounted set screws will always keep your shifter locked in position in any conditions from normal everyday street driving, to the most extreme racing conditions on the open course or in a straight line at all times! 1987 1988 1989 1990 1991 1992 1993 1994 1995 1996 1997 1998 1999 2000 2001 2002 2003 2004 GT GTS LX Cobra Bullitt Mach 1 Mustang Steeda Roush & Saleen Vehicles. Fits the following aftermarket shifters Steeda, Pro-5.0, Kirban, B&M, Hurst and every other shifter made for a T-5, T-45, 3650 and T-56. Our shifter handle comes complete with a spacer kit to fit stock or go up to a 7/16 hole size for other brands. No one else can stack up to the bold clean styling of our aftermarket Billet dress ups, Street Strip & Racing Suspension & Performance Parts for your late model American Muscle Car!